Did you know you can keep your garden growing by adding more plants without ever going to the nursery? You can grow foods from your kitchen scraps and not only save money but help the environment to boot (although don't forget that all these can also be used for your compost pile). Home grown veggies taste the best and when grown organically are free of harmful pesticides. What better way to get them than out of your own kitchen and garden? There are quite a few different vegetables that will grow from the scrap pieces that are normally thrown out or tossed into the compost bin. Here are a few examples of growing food from kitchen scraps. Green onions and scallions are the easiest plants to grow from kitchen scraps. Place the white root end into a glass of water and it will start to root out quite quickly. Change out the water or add more every week. 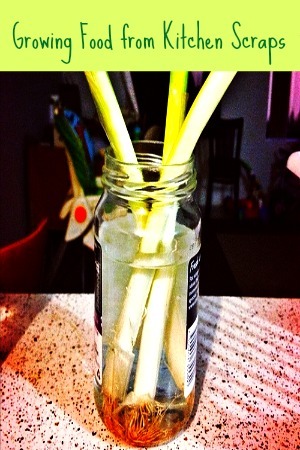 Place the glass jar in a sunny spot and harvest the green stems as you need a little onion for your dish. The white roots will keep growing as you snip the green stalks. Easiest way to never have to buy onions again! All of these veggies will regrow from the white root end when placed in a shallow dish. Cut the stalks off and use as you would normally, then cover the roots with water but don’t submerge the top of the cutting. Occasionally mist the cutting with water to keep the top moist. After a few days of basking in a sunny location with their roots in clean water, new leaves and roots will appear. With celery the leaves at first are yellow and then will turn green. You can then transplant the veggies out into the garden or into a container and within a few weeks it will grow a new vegetable head. Growing potatoes is so easy as they can regrow from any old potato that still has a potato eye on it. Grab you favorite type of potato and cut it into 2 inches square and make sure each piece has 1-2 eyes on it. Leave the cut pieces to sit at room temperature a couple days until they dry out and callous over. This drying out procedure prevents the potato piece from rotting after you plant it. Plant the potato pieces 6-8 inches deep with the eye facing upward, and cover with around four inches of nutrient-rich soil. As the potato plant begins to grow and more roots appear, add more soil especially soil loaded with compost. If you have a single clove of garlic you can regrow and entire plant! Plant the clove with the root-end down, in a warm area that receives plenty of direct sunlight. The garlic will root and produce new shoots. Once established, cut back the shoots and the plant will put all its energy into producing a large garlic bulb. Keep doing this over and over and you will never run out of fresh garlic! Have you ever tried to grow vegetables from kitchen scraps? How did you do? « New Coupons | SnackWells, Truvia, Peter Pan + More! I’m growing carrots and celery right now from scraps. This is a wonderful idea!